If the music is all that matters to you, you are adamant to gear up with pro audio equipment that feels the same way. 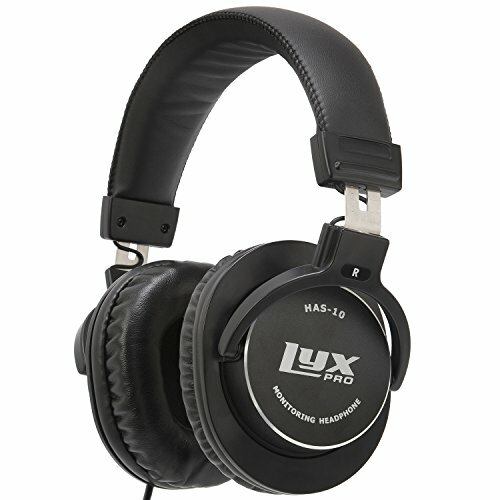 Meet the LyxPro HAS-10, a no-nonsense pair of quality headphones designed with one simple goal in mind: To provide professionals with a comfortable, affordable and reliable line into their monitoring and mixing situations. Plug these in at the studio, on the DJ stand, and anywhere else you want to be at one with your music. A closed back design serves to seal in the sound with little to no bleed. The HAS-10 is thus perfect for recording and mixing as well as for everyday music listening. The LyxPro HAS-10 boasts a number of smart features that come together to produce a true, balanced sound that professionals and everyday listeners alike will appreciate. With a pair of the newest 45mm neodymium magnet drivers, it achieves a covetable level of clean and honest audio representation. The powerful NdFeB magnet system also offers instant dynamic response for crisp-sounding vocals and instruments. Other impressive specs include a sensitivity rating of 98±3dB and a 10Hz-26kHz frequency response range. Now you crank the volume knob up to 11 without your music going all distorted on you. Slip on the HAS-10, and you'll discover the blissful comfort of a leather-stitched headband coupled to foam and leather ear pads. A total net weight of just 10.4 ounces makes for an extremely lightweight package, while a skeletal construction of stainless steel ensures years of durability. For a personalized fit, the 180° rotatable ear cups - which allow for single-ear listening - are mounted to telescoping arms featuring a sizing scale. Finally, the included 3-meter cable features a single-sided connection to eliminate wire tangling.